Edinburgh J. Bot. 60: 560 (2003 publ. 2004). Accepted Scientific Name: Drimiopsis atropurpurea N.E.Br. 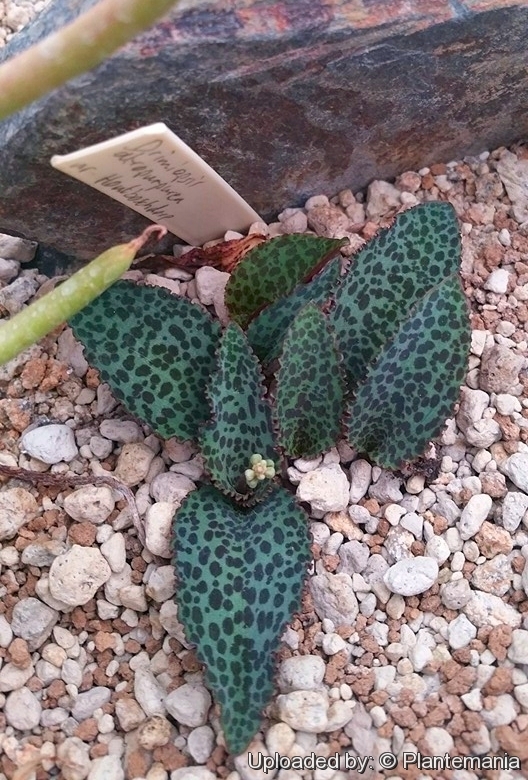 Origin and Habitat: Drimiopsis atropurpurea is native to South Africa (Gauteng, KwaZulu-Natal, Mpumalanga). Habitat and ecology: This species grows in relatively tall rocky grassland on shallow clays and on midslopes and crests of undulating norite hills. Description: Drimiopsis atropurpurea (syn. Drimiopsis purpurea, syn. Ledebouria atropurpurea) is a lovely bulb plant that differs from all the other species of the dark purple flowers. Derivation of specific name: 'atropurpureus,-a,-um'; from Latin 'ater' (atri), black, clothed in dark; 'purpureus', purple: dark-purple. Leaf: Often single. Petiole 7-12 cm long,. Blade 9-15 cm long, 5-7 cm broad, elongated-ovate, base slightly cordate, apex acute, glabrous above, hairy-pubescent beneath. Inflorescences and flowers. Scape 18-30 cm long, somewhat slender, 1-2 mm in diameter, hairy-pubescent. Racemes 2.5-7 cm long, densely flowered, lowermost flowers minute abortive and dropping off very early, uppermos flowers ascending and perfect. No bracts. Pedicels 1 mm long. Perianth 3-5 mm long, campanulate, glabrous, dark purple. Segments, oblong, exterior 3, with an sharp curved apex, inner 3, obtuse, shortly split and shape like a hood. Stamens included. Anthers pale yellow. Ovary pale. Style 1 mm long. Cultivation and Propagation: Drimiopsis atropurpurea is a lovely undemanding species. This attractive bulb has purple-spotted foliage that emerges in the spring and is an excellent ground cover for areas under trees where the shade is too deep for much to grow. It will tolerate heat and drought and is an attractive plant in pockets within a rock garden and also is an easy to grow houseplant; always a favorite carefree windowsill citizen, an excellent addition to any dish garden. Bulbs at the base of the plant must be above the soil. The plant's origin will make its bulbs tolerate heat and drought. Exposition: Likes light shade to part sun (it will take a few hours of sun without a problem), but adapts very well to heavy shade. Likes a bit of shade for best colour in leaves. Watering: During the summer growing period the plant appears to need much more water than the average succulent. It does fine with year-round water. Let it dry completely between waterings. Soil: It adapts to a wide array of garden soils comprising cactus and succulent soil and regular (peat, perlite, pine bark) potting mix. But an organic rich media (2:1 to 1:1 organic:inorganic) seems to work very well. Rich humus organic soil will make this plant multiply like rabbits. This plant needs well-drained soil; it does not like wet feet. Fertilization: Feed monthly with 50% strength soluble house plant food when it is actively growing. Hardiness: The species is winter deciduous and can take light frost but not a hard freeze, so best kept in a frost free place indoors and can be grown outside where there is no danger of frost. Pests and diseases: Slugs and snails don't seem to want to attack this plant as much as they do your traditional hosta plant. Propagation: It's very easy to grow and to propagate. Just separate the bulbs. Seeds or (usually) by division of bulb-clusters. Will multiply in the garden to form clumps that should be divided every few years.